A New Face In The Form Of Hard Rock For The Taj Mahal! A brand new Hard Rock International café is set to open up at the recently revamped Taj Mahal former-Trump-owned casino. 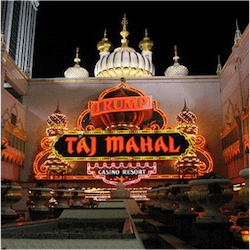 This gambling establishment was operated for a significant time by the beleaguered current president of the USA, Donald Trump. The Hard Rock Café will be opening its doors for the first time to begin trading officially in early 2018. Hard Rock International bought the Atlantic City casino once owned by Trump, and is now in the process of throwing millions of dollars at it, remodelling the venue with its own rock ‘n’ roll branding. The new project includes Hard Rock International opening its latest café inside the casino itself, but this will take the form of the current café, located on the famous Atlantic City Boardwalk, closing and moving to the new premises. The Atlantic City Boardwalk Hard Rock Café will end its operations on the 30th of September, and the construction for the new café is set to begin shortly thereafter. The café is set open around the same time that the brand-new Hard Rock casino will, and is likely to create more than 100 new jobs. It is also going to be a lot bigger than the current venue is. Hard Rock International purchased Trump’s Taj Mahal from Carl Icahn very shortly after it had to close its doors thanks to continued financial struggles. The casino was lately cleared of all of its physical resources in a liquidation auction, which saw bargain hunters getting hold of valuable relics from the Taj Mahal at very low prices as Hard Rock got ready to revamp the whole place. A water park and facilities for poolside gaming are in store for the revamped casino, and the 1 250-room hotel and casino resort is very likely to undergo an array of other additions before it reopens next year. In addition to the poolside gaming facilities and large water-themed park there are two enormous sports arenas planned as well. Hard Rock International’s expansion into the market for casino gambling including its acquisition of the once popular Atlantic City casino, and the company is more than confident that the relocation of its popular local café will attract hordes of tourists and players.